If there’s one liquor that’s made its mark on the national cocktail scene over the past few years, it’s mezcal. A close cousin of tequila, most mezcals have a distinctive smoky flavor, thanks to their particular production method: roasting the hearts of the agave plants underground before mashing, fermenting and distilling them. This smoke emerges beautifully in cocktails, including many of our favorite tequila drinks. 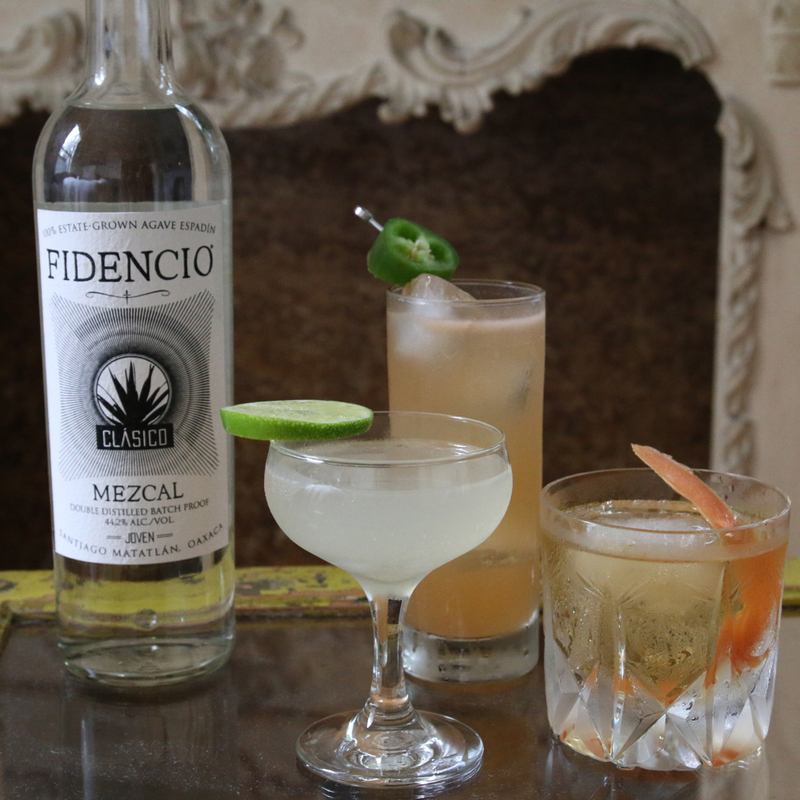 Though there are many brands out there, here we’re using Fidencio Mezcal (available nationally). Fidencio is a great expression of traditional mezcal: earthy and smoky, with a strong character all its own, at a good price too. Here are three cocktails that highlight the spirit—both familiar and new. A simple margarita is the perfect place to start—it lets you appreciate mezcal’s distinctive character in a familiar template. Fresh lime juice and a little agave syrup are all you need. We’re not looking for the fruity sweetness an orange liqueur would add, this is a vibrant, dry cocktail. Instructions: In a cocktail shaker with ice, combine 2 ounces of mezcal, 1 ounce of fresh lime juice, and ½ ounce of agave syrup (light agave dissolved in an equal amount of hot water). Shake that all up, strain it into a cocktail glass and garnish with a lime wheel. Mezcal and many Scotches share a smoky backbone, and both spirits are very much the product of their given locations, traditions and terroir. They mesh beautifully in this stirred cocktail, sweetened with just a bare hint of agave. Instructions: In a mixing glass, stir together 1 ounce of mezcal, 1 ounce of smoky blended Scotch (like the Black Grouse), and ¼ ounce of agave syrup (light agave dissolved in an equal amount of hot water). Add a dash of orange bitters. Stir it all together thoroughly, and strain it into a rocks glass over fresh ice. Squeeze a big grapefruit peel over the top, then add it to the drink as a garnish. In its simplest form, this Mexican classic is just grapefruit soda and tequila. We’re swapping out the tequila for mezcal, and throwing in a little fresh jalapeño to add a kick of heat to a summer cooler that’s refreshing enough to balance it out. This is a great drink to make by the pitcher. Instructions: In the bottom of a cocktail shaker, muddle (that is, smash up) 1 to 3 thin slices of jalapeño, depending on the heat you’re after (1 will be a fun little tingle; 3 is spicy). Add 1½ ounces of mezcal, 2 ounces of fresh grapefruit juice, and ½ ounce of agave syrup (simple syrup will work too, in a pinch). Add a dash of Angostura bitters, if you have ’em, and lots of ice. Shake that all together and double-strain (through a fine strainer) into a tall glass over fresh ice. Add 2 ounces of club soda, and garnish with a jalapeño ring.